It seems that many of my fellow Lotro bloggers and players are currently in a state of Lotro fatigue, and have put the game on hold, or their blogs on hold. Even the forums have been relatively quiet lately. Much of what used to be a bustling community seems to have come to a pause, as if everyone is holding their breath and waiting for what is to come. My own gaming activities have slowed somewhat, but only slightly. I am trying to get my third character to 95 now, and finding time to play with lower level alts as well. This game is so huge and beautiful, that I will always find a place to enjoy myself as I have alts at all levels in all regions. Nevertheless the quieting down of the creative buzz within the community does not pass unnoticed. However unsettling this all may seem, I think it is actually a good and much needed thing. With the latest reduction of staff at Turbine and Aaron “Rowan” Campbell having taken back the Helm (pun intended), interactions between Turbine and the player community seem to have become more intimate and personal. I enjoyed myself a lot at our server’s “take the Hobbit to Isengard” event and I think the life-stream talks are doing the community a lot of good. I could focus on all the things that I feel sad and angry about regarding Lotro but instead I rather choose to focus on that which I enjoy. So there, another outfit, as outfitting is still my passion. And there are still pieces around that I have never used in an outfit, just waiting to find the right match. The chest piece in this outfit is originally a PvMP armour piece, only available if you have enough commendations. Lalia’s Market is also stocking this as a cosmetic currently, but may rotate it out of stock again by next update. Update 13 will bring us a new dye colour: Steel Blue. It’s gated behind a reputation grind so it will be a while before I can get my hands on that one, but that’s good motivation to do the grind! I am also curious about the finalized update to the avatar appearances, and curious what my characters will look like after the update. As far as I’m concerned, male elves can’t get any worse, so any remodeling is an improvement in my opinion. However I am well aware that many disagree with that, and I also respect that, so I can only hope that the overhaul will not make too many players unhappy. I am certainly looking forward to taking some shots with the updated models. Last but not least I would like to point out a great outfit video that my fellow blogster Cithryth made. She makes incredible outfits and showing these off in video format is really awesome. Shoulders: Songmaster’s Shoulders, black dye (Ost Galadh, Minstrel trainer). 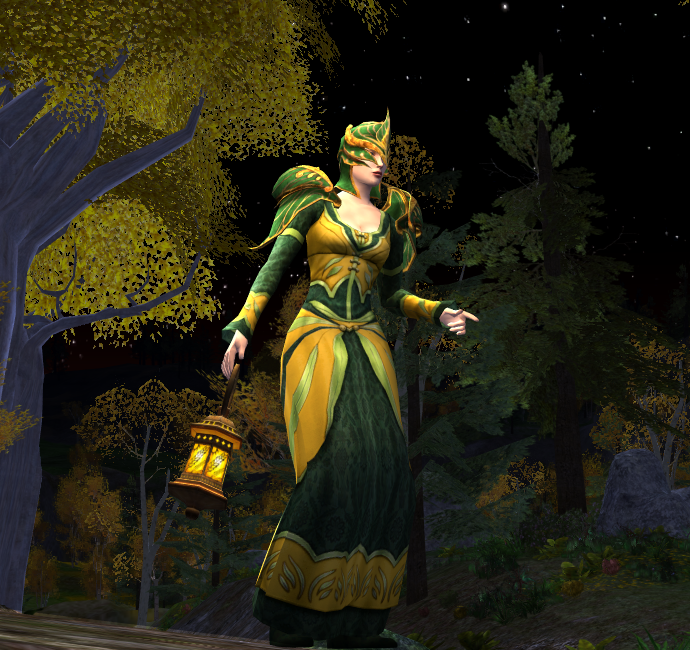 Shoulders and Boots are also available as Lothlórien Minstrel Raid Armour pieces, and sometimes as cosmetic pieces at Lalia’s Market or on the Mannequins. We all go through ups and downs, I enjoy the quiet as much as I enjoy the elation. I hope this quiet time prepares us for another rush into something exciting! And I am going to enjoy levelling my elf hunter male now! It’s amazing to discover that even after 7 years of playing Lotro, there are still things I had not noticed before. Yes the gameplay has changed, as have many other things. I am still finding myself missing certain skills and have still not adjusted completely to the changes. I’m not certain that waiting for things to change back again makes any sense though. So I chose to make do with what I have now, and focus on all the good things that this game still gives me. This so beautiful! . .and yes, I completely agree about Lotro being enormous. Overwhelmingly so, in fact. It was one of the reasons I put my own blog on hold; I really needed to catch up and get to lvl 95. Indeed, many many hours can pass without ever leaving the wardrobe! No outfitting allowed if you need to catch up! I’m not usually a big fan of most of the robe-type chest pieces in LOTRO but this is one of the exceptions. Nearly every outfit with this piece looks great! I especially like how the gold trim of the shoulders and boots matches the gold of the robe. And big thanks for the shout out for my video! I’m really excited about showing off outfits in video format as I feel that it can lend outfits a very different feel compared to screenshots. I love what you did on that video and think you found a great new format to share your Lotro experiences. Also lovely to hear your voice! I hope you’ll do more of those related to outfits, perhaps more instruction oriented? There aren’t enough of those ones around! Thank you! I’ve actually started a LOTRO Outfits video series (https://www.youtube.com/playlist?list=PL40jhKogqMM3JCQR81lkNQ9WVpH0o0jDt) and someone suggested I do one on how to dress for lvl 10-15s for when you go visit other servers. That one will definitely be instruction oriented! Personally, I logged in I think all of 3 times since HD released.. tired of the game’s bad performance, was made to easy for me personally and no good group activity since RoI. It’s a shame. I agree on all your points. I am currently playing with very different expectations than I used to. It’s a different game now, but there are still plenty of elements that I really enjoy. HD has also had a huge negative effect on the long-term LOTRO player base… a lot of the old guard decided that that was it, thankfully not all and I think there is light at the end of the tunnel, a shiny explosion will be U13 – I am genuinely excited by this 🙂 I think with TURBINE’s new communication channels and the obvious wish to be more communicative the NEW online community will slowly grow again. WIth that and continuing improvements I am hoping that LOTRO also gets a new influx of players. I am also still very hopeful for the future. The decline in interest is undeniable, but I also feel the Turbine team is working hard to find a new balance. Both within the game as well as behind the scenes and in their communication with the community. Not all is lost, and U13 does look very good indeed. I feel the worst is behind us and new adventures still await us! I will take a guess that the reason a lot of players are MIA is because TESO (The Elder Scrolls Online) has just been released. I know that for myself having reached lvl cap in LOTRO, there wasnt much left to do in game. So I moved on to a new mmo until the new expansion comes here to LOTRO. Hi there! Just wanted to ask about the satchel, since I don’t remember you mentioning anything about it. Is it the same reoccurring one that I’ve seen in a few of your other outfits, or something else? If so, where can I get one? Thank you! This satchel is used cosmetically (you can even put satchels in the wardrobe and dye them!). This one is a crafted level 30-40 satchel. Be aware that the cosmetic satchels purchased from the Lotro Store can NOT be dyed!